This was one of my top picks for the Spring Season, and so far things look very promising. Shingeki no Kyojin is set in a world where giants threaten the survival of the human race. Over 100 years after the giants first appeared, humans now lived in cities surrounded by enormous 50 meter high walls. Safe inside the walls, humans continue on despite the ever looming threat of annihilation. The story follows Eren Jaeger (Yuki Kaji) and his adopted sister Mikasa Ackerman (Yui Ishikawa). Eren is frustrated at having to live “like livestock”, and wishes to join the Recon Corps in order to see more of the world beyond the walls. His mother Carla (Yoshino Takamori) of course is strongly against it, while his father, the esteemed Dr. Grisha Jaeger (Hiroshi Tsuchida), seems to be supportive. 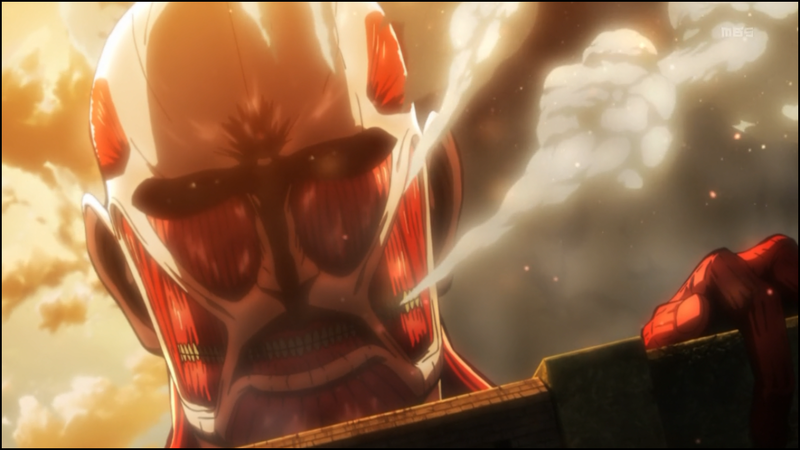 Eren’s resolve is nearly shaken when he witnesses the Recon Corps return from a botched operation. Many humans are killed and hope seems to be futile. Eren meets with his friend Armin Arlert (Marina Inoue) and they discuss their goal of joining the Recon Corp.
Just then, a flash of thunder strikes outside the wall and sends a shockwave through the city. The townspeople look in horror as an enormous titan rises up and creates a hole in the wall, allowing the smaller giants to enter the city. Things get bloody quickly as buildings are destroyed and people are crushed. In the midst of the chaos, Eren rushes back home to find his mother. He finds her pinned underneath the crushed ruins of their home. Eren and Masaki try to life the rubble off of her, but the mother realizes what has to happen. With a giant fast approaching, she tells Hannes (Keiji Fujiwara) to take the kids and flee. They look back in horror as they witness their mother eaten by the giant. The setting of Shingeki no Kyojin is well established in this first episode. The threat of giants constantly looming just beyond the walls surrounding the city has forced humanity to barricade themselves from the rest of the outside world. Society seems to have reverted to a medieval level, with no such things as cars or cell phones existing. It’s even implied that there is some form of hierarchy ruling over the land and governing the people. However, the Recon Corps use some sort of special technology to propel themselves into the air in order to fight giants. Though we only catch a glimpse of that, I’m excited to see how that plays out during the action scenes. The animation is very stylized. The art is punctuated with dark bold lines, which is especially evident on the people. It actually reminds me of the art style of anime back in the 1980s. I think it actually looks nice and makes it look unique and detailed. The art style also makes the giants look genuinely frightening. They look just like grotesque humans, only with eerie lipless smiles on their faces. It’s a frightening sight to see one of them walking down the street and looking for humans to eat. During the attack on the city, it turns into an absolute bloodbath as people are crushed left and right. Though not overly gory (so far), the images that are shown have their intended impact. I absolutely cringed when the mother was killed. 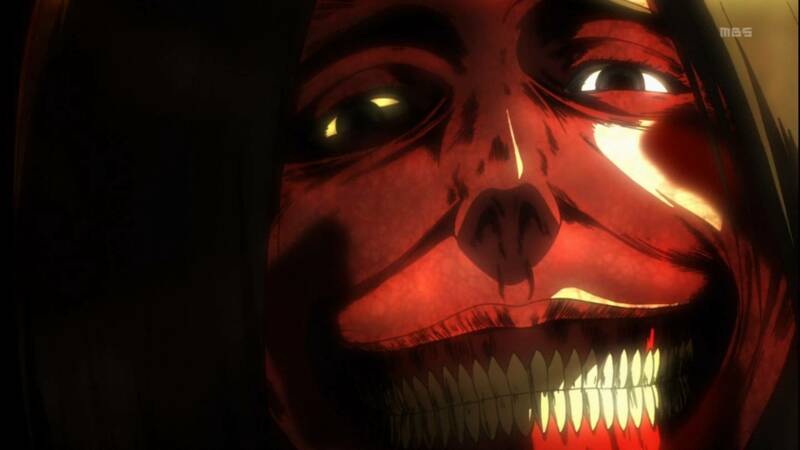 Shingeki no Kyojin has the makings of a great action anime. The previews showed fast paced action set pieces with humans going head to head with giants, which I’ll be excited to see. It has a very serious tone as well, so hopefully it doesn’t get too wacky with the fights. The next few episodes looks like it will focus on Eren, Mikasa, and Armin joining the Recon Corps and learning to fight back, which gives us a chance to see their development from innocent children to vengeful fighters. This looks like a great start to me. Anyone else getting a vague post-apocalyptic feel from this? Maybe when they venture outside of the walls, they find the ruins of Tokyo or something. Bigger plot twist: the giants are mutated humans from experiments gone wrong.